STILLWATER – Students across Stillwater will be heading back to school next week, and for many of them, their day starts and ends on a bus. 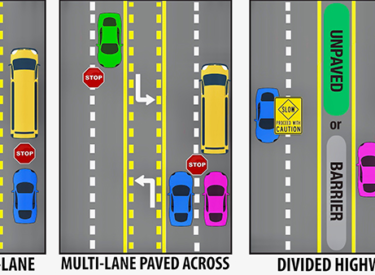 It’s a good time to review state law on passing school buses because, starting Monday, the Stillwater Police Department is launching an enforcement emphasis effort for school bus loading zones. According to Captain Gibbs, when school buses are loading or unloading children, bus drivers activate their red flashing lights to let other motorists know they need to stop regardless of their direction of travel. All traffic on the roadway approaching a loading school bus must stop. The stop arm is usually extended during these times. Drivers may proceed once the bus resumes motion. The maximum penalty of anyone found guilty of passing a loading school bus is a $260 fine and an automatic one-year suspension of his or her driver’s license. Stillwater Police Department is focusing extra officers on this enforcement effort. “It is our hope that every motorist will pay close attention to protect our children and that we will not observe any violations. However, we will exercise a no tolerance approach and issue citations for any observed violations,” Gibbs said.